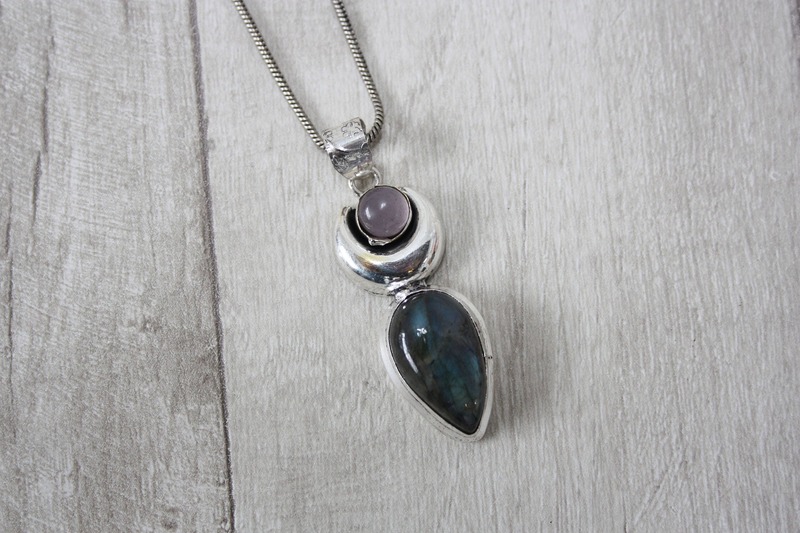 With crystals sourced on our adventures in India, this is a Handmade treasure created using a Silver plated necklace and beautiful high quality teardrop labradorite crystal and mini rose quartz cabochon. . It is a bold necklace that has been handmade using powerful crystals and silver crescent moon detail. Hung on a sterling silver chain the crystals glimmer and shine when you wear them. This is a bespoke handmade piece meaning we only have one of these available. A stone of mysticism and magic. 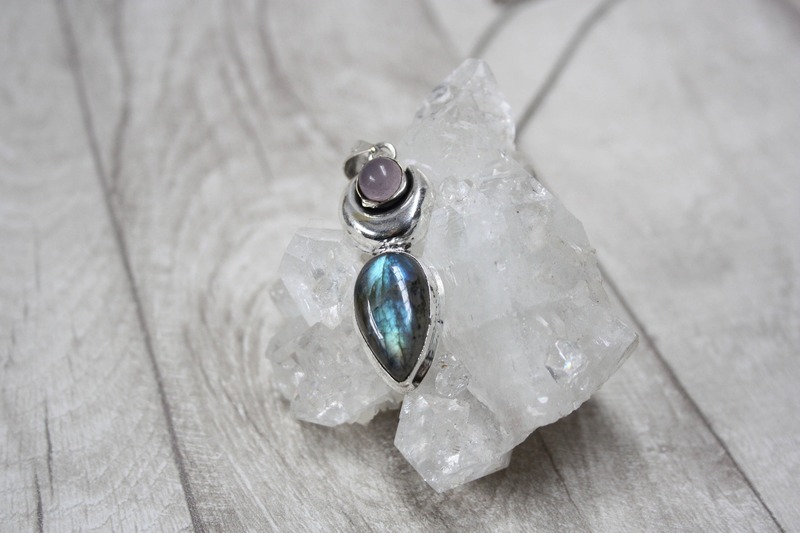 It is used for protection against negative energies and excellent for awakening one's own awareness of inner spirit, intuition and psychic abilities. 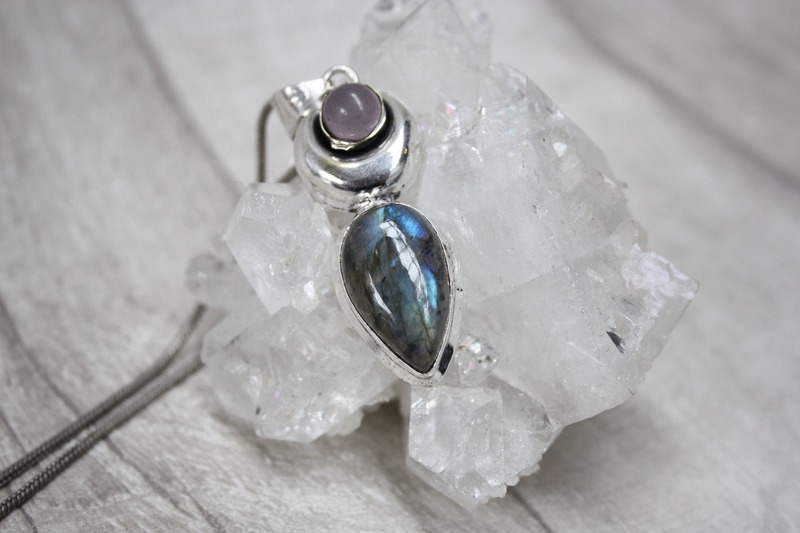 Labradorite is associated with the solar plexus chakra, making it great for working with the base, the third eye and also the throat. A powerful and popular stone linked to healing the heart and drawing away negative energies. It is used to open the heart and wearer to let love channel into those who wear it. It promotes self love and confidence and has great healing powers when worn near the heart. Together these crystals make this handmade piece both beautiful and powerful.